with the leading professional in MLB. and trained MLB players and teams for nearly 2 decades. 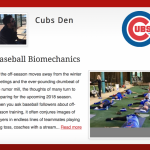 Comprehensive, moderate to high-level intensity training targeting all areas of baseball biomechanics. Less rigorous regen programs designed to reduce muscle fatigue and enhance endurance. Shorter, condensed workout to practice in any location, even hotel rooms. TRAIN NOW – Directly with Katherine!